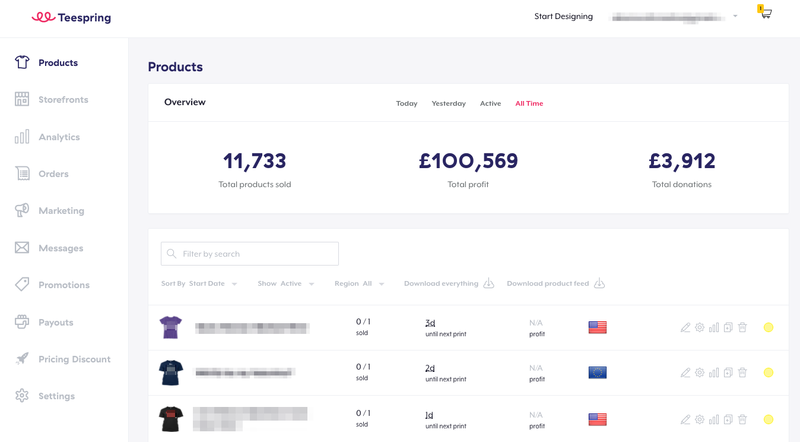 Welcome to your Teespring Seller Dashboard! This is the place to find helpful insight on your sales trends and monitor your online business with Teespring. This is where you will be able to view and edit all of your product listings. Storefronts is a great tool if you want to display multiple products listings in one place (and be able to share numerous products using one URL). Learn how to set up your own store here. Gain valuable insights into your business by visiting your sales analytics. Knowing your most popular products and sales channels can help you optimize listings. Keep track of all your personal orders in the “Orders” section; you’ll be able to see the number of units ordered, order date, order number, delivery status and purchase amount. Use this section to add all of your tracking pixels. You can also complete Facebook Authentication here for additional pricing discounts (see “Pricing Discounts” below). You can message past buyers through your Teespring account or download buyer emails for email marketing. This tool is ideal for thanking customers, promoting new campaigns and giving out discount codes! Learn more about accessing buyer emails here, and email marketing here. You can use the Promotions tool to create discount codes for buyers; there are a variety of different discounts you can offer—learn more about how to use this tool to increase sales by up to 60%. Some might argue that this is the most important section of your seller dashboard—where you get paid! Payouts can be sent via PayPal or Payoneer. Get more details on these different payout methods and payment timelines here. Just starting out with Teespring and want a higher profit margin? You’re in luck! Teespring offers flat pricing, but our Pricing Discount Tiers enable sellers to earn even more profit on each item sold. Learn how you can make more profit with Teespring. Use your dashboard Settings to update your profile information such as your display name, phone number, login info, contact email, etc. You can also opt-in to sales-driving services like Boosted Network, Teespring Marketing and more. You can go here to add other team members to your account too (if you work with other sellers or designers).